Key Stats: 106 & 109 tackles in his two years as a starter. 18.5 tackles for loss & 4.5 sacks in 2016, 14.0 TFL & 5.5 sacks in 2017. Only 19 years old, will turn 20 on May 2. Where He Fits on Bills: He fills a huge hole at linebacker, specifically middle linebacker vacated by Preston Brown. Edmunds is a sideline-to-sideline pursuit linebacker, which is exactly what Sean McDermott needs on his defense. Who He Pushes Off Bills Roster: There’s not a lot of depth at linebacker. Ramon Humber’s status could be tenuous. So could Tanner Vallejo. Expected to Start Right Away: Yes. 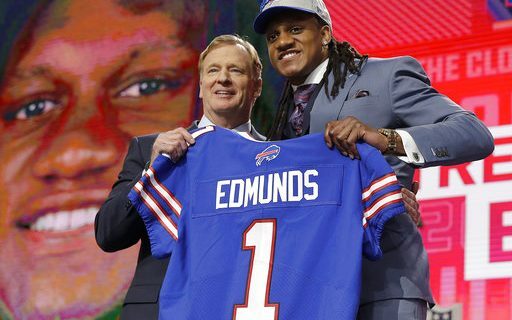 While McDermott would not commit to it after the Draft, Edmunds should go right into the middle linebacker position from day one. Paul’s Take: A brilliant move by Brandon Beane to trade up in the first round, and give up only a third round pick, to get the 2nd best LB in the Draft who fills a huge hole for the Bills. We talk so much about how the Bills needed their own Luke Kuechley. That should be Edmunds. He is not the toughest, point of attack hard hitter. But he can run and cover. Exactly what the Panthers get out of Kuechly. Normally a tall linebacker is not a fit at the inside position. But Edmunds overcomes that. Or maybe he eventually plays outside in a hybrid role. Edmunds comes from a football family, and that should even further prepare him for a quick transition to the NFL.